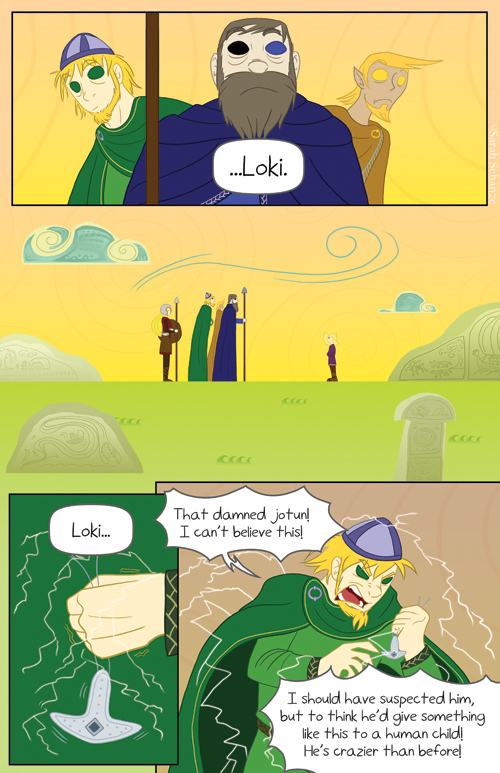 It’s odd because I remember once reading that Loki was also a son of Odin. Can’t remember where and I could never find it, or any mention of it, again. I found it strangely appropiate, like norse mythology was a bit ashamed of that fact. Loving this comic by the way. Well Loki was Odins adopted son, and he was a Jötunn. Son of Fárbauti and Laufey. Not all stories and backgrounds of each character (be it vanir, Aesir or Jötunn) was even known in all of Scandinavia, but fdifferent in different parts. And thank you! I’m glad you like it. 😀 I had to look up the Kalevala but that would undoubtedly be a great story to tell. Just found the comic today, and read through it twice, noticing the comments this time. Loki has seen various origins in my reading of different mythology sources. In some he gained the benefit of being in the presence of the gods or Aesir because of a pact he made with Odin where they mixed blood, making him semi divine. In others he is described as simply being “born of fire” and seems to get his deceptive nature from the flickering and constantly changing/destroying nature of fire. Even more interesting these same sources also describe him as having frost giant lineage. Sorry for the wall of text, but as a chaser, great comic and I look forward to seeing more of it. Thank you so much! 😀 I’m glad you’re enjoying the comic so much, and thanks too for that extra info! Just kidding. Good comic by the way. With the way Thor’s acting, that might be like the pot calling the kettle “black”. WHY are they surprised by that? If they ever had any problems, it probably had SOMETHING to do with Loki.